We thank you for your business and look forward to taking care of your pet! 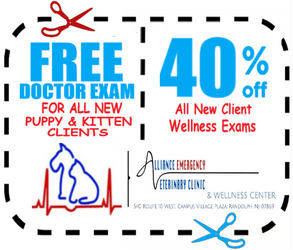 Alliance Emergency Veterinary Clinic & Wellness Center is a 24/7 veterinary clinic located in Randolph, NJ. We aim to make every client's experience at AEVC as easy and informed as possible! Check out some of our pages within the New Patient Center tab, to get some insight before your first visit with us! Our What to Expect page will give you some insight on the process once a patient arrives at AEVC. We have Emergency and Wellness Clinic check-in sheets available for download on our Online Forms page for any client who desires a quicker check-in process. Check out our Payment Options page to see what forms of payment are accepted at AEVC and where to turn when financial burdens arise.